Roundtable: Amid firing surge, which coach is now on the hottest seat? After three head coaches were fired following Week 6, which coach is now on the hottest seat? SI's college football writers make their picks. It’s only mid-October, but the coaching carousel is already whirling at full speed. Three head coaches were fired after Week 6 and a fourth resigned. That has hardly resolved the hot seat watch, as several more coaches are still hanging on with little job security. Who could be the next to be fired in the wake of Dan McCarney, Randy Edsall and Steve Sarkisian’s axings? SI.com’s college football writers weigh in. They already waited a year too long. Why further delay the inevitable? While Kyle Flood has returned to his post at Rutgers, the school's internal investigation into the football program smacks of an effort to find some reason, any reason, to fire its coach for cause and save buyout money. Still, the coach in the most trouble now is the same coach who was in the most trouble at the start: Miami's Al Golden, whose team has accomplished nothing to recommend his return for 2016. The last-second win against Nebraska looks worse with every Cornhuskers loss. Golden coached his team out of a chance to win at Cincinnati. And while the Hurricanes pushed Florida State last weekend, the end result was a loss. the program's sixth in a row to its in-state rival. Without wins over Clemson and Duke in the coming weeks—if that is even enough—one suspects the Golden-Miami marriage will dissolve, just as everyone suspected it might. At the beginning of the week, my answer to this was Sark. But now I think I have to go with Golden. Yes, Miami is 3–2, but it was practically a foregone conclusion that Golden was going to lose his job this season. Now the Hurricanes are coming up on a rough stretch (vs. Virginia Tech, vs. Clemson, at Duke) and I don't see it going well. They've surprised some this year—most notably in the win over Nebraska and by giving Florida State a game last week—but the Canes don't have a salty defense, and I don't see that changing. At the U, .500 isn't gonna cut it. The Boilermakers haven't shown much, if any, progress in Hazell's third season at the helm. Purdue (1–5) did keep Michigan State in check in a close 24–21 loss, but it also dropped games against Group of Five foes Bowling Green and Marshall by double-digits each. Perhaps most telling, Hazell has won just a single Big Ten game during his tenure in West Lafayette. This season the combined record of Purdue's remaining opponents is 21–11. The future doesn't look bright for Hazell. After entering the 2015 season with a 23–38 record with the Cavaliers, London needed a strong start to maintain any hope of keeping his job. Going 1–4—a stretch that included a 56–14 beatdown by Boise State on Sept. 25—isn’t exactly what he had in mind. London could be gone before year’s end, especially if Virginia can’t beat a mediocre Syracuse team Saturday. He barely survived last season, and a 1–4 start to 2015 hasn’t cooled his seat. London desperately needed that upset of Notre Dame in Week 2, but DeShone Kizer’s deep ball to Will Fuller killed that. He is now 12–29 over the last 3.5 seasons with just five conferences wins in that span. That kind of sustained failure can’t last, so unless London starts winning in a hurry, he’ll soon be gone. Unless Golden beats Clemson in two weeks, the ‘signature’ win he’s been seeking won’t come in 2015. If he loses to anybody except Clemson from here on out, it’s hard to imagine how he keeps what was once one of college football’s most coveted positions. 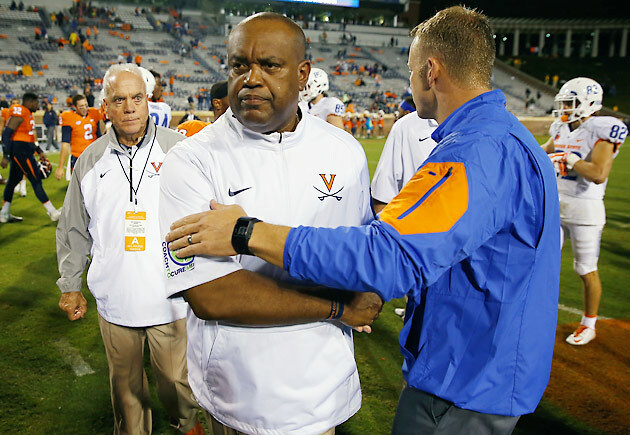 London entered the season on the hot seat and seemingly has done nothing to improve his chances of keeping his job into 2016—the Cavaliers’ only win came against FCS foe William & Mary (this week’s home game against Syracuse might be winnable). Yes, Virginia’s nonconference schedule—at UCLA, Notre Dame, William & Mary, Boise State—was brutal, but the Cavaliers lost at unranked Pittsburgh on Saturday and don’t look capable of competing in a division (the ACC Coastal) with no likely College Football Playoff candidates. Barring an unexpected turnaround, this doesn’t look like it’s going to end well for London. The correct answer should be Flood, but if Rutgers’s embarrassment of an athletic department hasn’t fired him by now, it’s likely not going to based on anything that happens the rest of the year. Whether Golden’s firing would be deserved is something of a debate—the results haven’t been great, but the obstacles presented by the program's sanctions during his tenure would have been tough for any coach to deal with. Regardless, as the ubiquitous “Fire Al Golden” banner indicates, momentum has been shifting away from him for quite a while now, and with the Canes headed toward yet another competitive but underwhelming season, it appears Golden’s time has come.